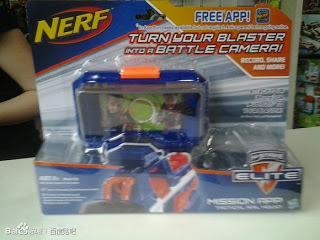 We've been hearing about NERF making it's way to the smart phone for a while now. We have already seen the iPhone cradle that is designed to attach to the tactical rail but we have heard nothing of the app that has been developed to support it... Until now! A while ago I was asked to help write a review for some Nerf LARP organisations. This was no small task as I have little to no knowledge of what Nerf LARP is all about. Knowing that others must feel the same, I wrote this instead. It is a review of the LARP group, 'Big Damn Heroes', but it is also an article for those who want to try Nerf LARP, but do not know where to begin. Enjoy! Upcoming Zombie Strike Range - Pics included! Whilst on his travels, MerryUnBirthday spotted both the 'Pink Crush' and the 'Guardian Crossbow' on the shelves in The Entertainer. 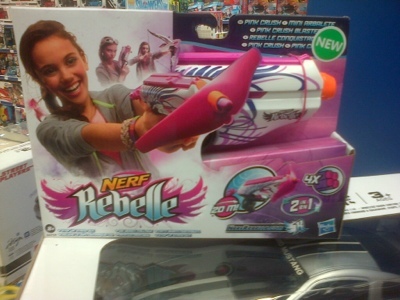 Priced at £8 and £25 respectively, this is the first time these blasters have been spotted in stores. I received my Guardian Crossbow through the post a couple of days ago. After recently purchasing a Rebelle Guardian Crossbow, I found it a difficult blaster to review. Don't get me wrong, I like it, I just cant find the words to describe the way it makes me feel. What I needed was a representative of the lines target demographic. What I needed was a girl. Then I remembered that my wife is such a creature. 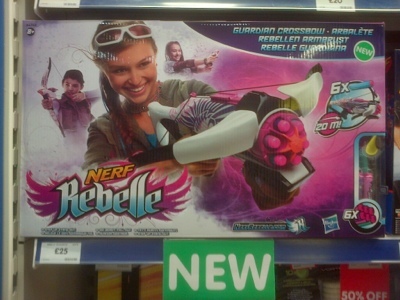 She seemed genuinely excited by the blaster so without further ado, I hand you over to Mrs. UKNerfWar for a woman's perspective on the Nerf Rebelle Guardian Crossbow. My sources at Hasbro confirm that the Rapidstrike will hit the shelves from 1st August so start saving your pennies now, this thing is going to be epic. I can't say when the Rapidstrike will be available in other territories but we can assume that it will be around the same time, if not before in some areas. I am totally stoked about this blaster. As I have said all along, it is much more my style than the MEGA Centurion. What are your thoughts? 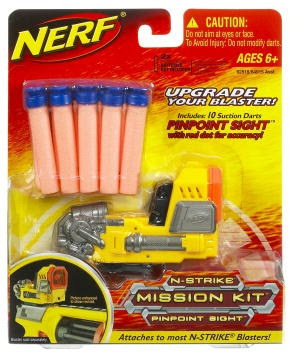 Like many of you, I have recently been frustrated by the exclusivity of what is possibly my favourite Nerf accessory. Fortunately for us, the chaps over at Bay Area Nerf have decided to try and do something about it.